It would be nice to think my sons could decorate a cardboard treehouse as wonderfully as that one up there but I’m under no illusion they’re quite up to that skill level yet! It’s a good thing I focus on the experience and imaginative play side of things and don’t care so much about everything being perfect! 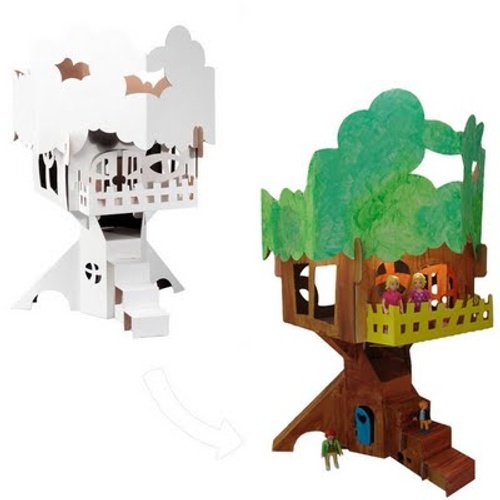 The Calafant Treehouse reminds me of those much-coveted and now highly collectable Tree Tots Family Treehouses from the 1970s. The house will come to you as a flat pack of cardboard pieces which require no glue or scissors to put together. Simply slot in the pieces with your child, allow them to decorate, then play to their heart’s content. Add in some small dolls to the mix and you have an effective, eco-conscious doll house. It’s made from recycled cardboard and I’m having a hard time reconciling the fact I’ll never have a real one of these. Wouldn’t it make the perfect parent’s escape in the backyard? Ah the peaceful cups of tea I could have deep within… it’s even sparked my imagination! Available for just $29.95 plus post, from State of Green. See also our other articles on more cardboard products, including cubbies and furniture.